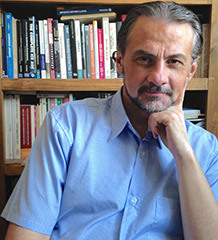 Dr. Ciprian Ardelean studies the earliest human occupations in Mexico at the end of the Ice Age and the beginning of the Holocene, mainly in the northern highlands and deserts. He is mainly interested in American early prehistory and the peopling of the Americas, the Pleistocene climate, lithic industries, ancient cultural diversity and changing environments. From his main affiliation as lecturer-researcher at the University of Zacatecas, he has been searching for the earliest human presence around the Tropic of Cancer in Mexico during the last decade, currently leading the international project "Pleistocene Hunters of the Northern Highlands" (Cazadores del Pleistoceno en el Altiplano Norte, in Spanish). Dr. Ardelean conducts constant and intense field explorations in the form of long expeditions in difficult-to-access areas, performing surveys and excavations in caves and rockshelters, as well as in hunter-gatherer open campsites around old lake basins. Pleistocene, earliest humans in Americas, lithic technologies, caves, hunter-gatherers, field exploration, palaeoclimates. Project director and field leader of the "Pleistocene Hunters of the Northern Highlands" archaeological project on Central-Northern Mexico, where we study mainly a high-altitude cave with indicators of Pleistocene human occupation going back as far as 30,000 years. Almost 20 years of experience in teaching archaeology to undergraduates in Mexico and other countries. Courses: Archaeological Theory, Designing Research, Management of Projects, Hunter-Gatherers Societies, Prehistory, Lithic Technology, Old World Archaeology.